Lately, we heard a lot about the unannounced Samsung Galaxy S5 Active, and we also saw several videos allegedly presenting its AT&T variant (SM-G870A). Well, we can now check out the S5 Active in another (short) video, which seems to confirm that the handset has a 5.2-inch display, thus being slightly larger than the 5.1-inch screen of the regular Galaxy S5. The pixel resolution of the S5 Active’s display isn’t changed, so it’s the same 1,080 x 1,920 that’s also seen on the regular S5. The larger screen is hardly noticeable if you put the S5 Active next to the original S5. According to TK Tech News, the S5 Active is IP58-certified, thus providing the same levels of dust- and water-resistance as Sony’s Xperia Z2. The regular Galaxy S5 is IP67-certified, which means you can’t keep it underwater for more than 30 minutes (but you will be able to do this with the S5 Active). Another unannounced Samsung handset that supposedly has a 5.2-inch screen is the Galaxy S5 Prime. Unlike the S5 Active, though, the Prime should offer a pixel resolution of 1,440 x 2,560. We’ve yet to find out when Samsung is planning to announce the Galaky S5 Active and S5 Prime. It should happen in the near future anyway. Yesteryear Samsung copied Apple, today copies Sony (dust and waterproof) and probably tomorrow will copy LG (very slim side bezels). When will you stop copying the others, Sammy? Erm, Did I make mistake with my words? Correct me if I'm wrong. It seems you do not understands some basic things. First, it is not copying to add features that other companies put in their products. It is meeting the demand. Copying the looks of something is totally different. Second, it is like you do not know that these companies are dying for our approvals, costumers money!‌ Unless you own one of them you shouldn't be upset that Samsung is copying others. Which is not! Thin bezels are copying? Protection from the elements is copying? Are you deficient? Might as well cite the Motorola DynaTAC. It was "portable" and had this amazing invention called a "screen". Or maybe the IBM Simon is more appropriate. Touchscreen QWERTY keyboard, PDA, pager, fax, etc. Every smartphone since then has copied from the Simon. Hey, check out that douchebag Henry Ford, copying those Mercedes Benzes! 4 wheels? No horses pulling it? That's design theft!!! I'm not saying Samsung doesn't borrow elemtns from other companies. Everybody borrows from everybody. But thin bezels and waterproofing? If those are sacred innovations, then maybe I should see a lawyer about sueing people for stealing my inclined plane idea. 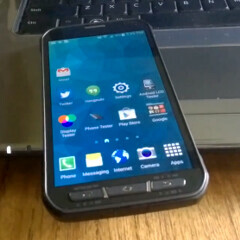 TK also hinted at a Galaxy S5 Active mini for ATT. I think you spend to much time looking at Samsung phones. Just STOP! Almost done for the LG leak and now from Sammy, why android manufacture so desperate to leak really drive me nuts! I hope the S5 Active is like the S4 Active and has an LCD screen and not pentile/AMOLED. Seems to be a non-pentile Amoled. Either way, TK suggested the screen looked better in his opinion.. Still do not understand the lack of >16gb. Phones should be minimum of 32. 16GB phones are to push people to Google Drive, OneDrive, Dropbox, ATT Locker, etc., so all their data can be easily copied and sold by the various tech companies.It also makes more customers use more data which the telecoms really like (those that decide not to get an SD card). There really is no other reason. Certainly not saving $3-4 worth of flash memory. It's awkward how Samsung has to make a special version of S5 (S5 Active) to make it as water-resistant as Z2...I'm not against Samsung, but just wondering why not instead they had made the S5 itself IP-58 certified? I hope it's more rugged that the s5.. I played around with an employee's s5 in white and it just felt cheap and toy like.. the back cover in white wasn't soft touch and when you sat it down it sounded hollow..